Staying at Villa, means great choice of a magnificent location overlooking the Atlantic Ocean on the outskirts of the city, yet just minutes from the city center. Guests enjoy all the privileges that the house offers. The Villa is a very nice place, due to the warm and friendly atmosphere, distinctive furniture, English-style leather sofas, fireplace with fireplace, wonderful and exotic decorative pieces, amazing paintings on the walls, full of green plants everywhere . Mezzanine, of enjoying full bathroom. The rooms are well furnished and decorated. Equipped with TV, Wireless, Radio, and individual heating. All rooms enjoy a view of the Sea With the possibility to have breakfast on the spacious balcony, offering the evening, the alternative to enjoy a cocktail while watching a sumptuous setting of the sun. In the garden you can enjoy a delicious meal in the barbecue area you can do yourself. You can also enjoy the shade of palm trees, in the company of a good book and listening to the birds chirping. The villa offers a nice pool as well as a lawn area with total privacy. It is a true private and friendly solarium permanently taking in the panoramic view of the sea and wild islands. In the distance at the ships that pass there with towards the port of Funchal. Due to the location of this excellent villa will always have a constant and incredible scenery, located near the area "Charcas" Zen area considered only place in the world. The famous statue of "Christ the King" on site gazebo, offers an excellent panoramic view of the Bay. It is possible to use the new infrastructure, the cable car, a few meters from the house with the particularity of being able to swim in the warm sea at the bottom of the hill where the house is located. Along the seafront, has 1 holiday complex with local restaurant, famed for its seafood rice and have a memorable lunch or a romantic dinner by candlelight. A magnificent place is considered. The panoramic view of the Bay and the Port of Funchal at night is stunning, looks like a Christmas crib due to the different colors of lights that illuminate the city of Funchal. Top Villa mit sehr schöner Aussicht! Wunderschönes Haus mit luxuriöser Ausstattung! Wir waren zu 5. dort, es blieben keine Wünsche offen. Auch zu 8. könnte man dort einen sehr schönen Urlaub verbringen. Diese Villa besticht (nicht nur) durch ihre super Lage. Direkt an der Steilküste, umgeben von üppigem Grün und nur das weite Meer vor einem mit Blick auf die Islas Desertas, hinter denen im Winter die Sonne aufgeht. Eine Freude, nach den Ausflügen hierher zurückzukehren. Thank you for your kindlyr great comments. We are very happy indeed that you enjoyed the Villa and we do hope to welcome you once again..
Wir verlebten mit vier Personen 11 wunderschöne Tage in diesem tollen Objekt. Die Aussicht auf den Atlantik ist gigantisch schön. Das Haus ist ruhig gelegen und in einer Art Kolonialstil ausgestattet. Wir haben sehr schöne Ausflüge auf der Insel mit unserem Mietwagen unternommen, aber haben uns immer wieder darauf gefreut in unsere Unterkunft zurück zu kehren und den Pool zu nutzen oder den Grill anzuwerfen. Der fehlende fünfte Stern resultiert daraus, dass kleine Mängel wie teilweise kaputtes Geschirr, defekte Beleuchtung vorhanden waren. Der Vermieter war jedoch immer erreichbar, um entsprechende Mängel abzustellen. Wir möchten uns hiermit bei dem Vermieter für 11 wunderschöne Tage auf der Insel Madeira bedanken und werden sicherlich zurück kommen. The Villa Belo Horizonte is located in a magnificent position with 180 ° uninterrupted view along and across the Atlantic Ocean. The two-story house is a falezia to (142 meters) above the Natural Reserve of Tern Sea .. This is a protected nature site and is home to special fish, indigenous birds and the Mediterranean monk seal swimming in the area of ​​its base in the uninhabited islands. Villa Belo Horizonte is 13 km from the airport, 9 km from the city of Funchal, 20 km from Santo da Serra Golf Club and 8km from Haystack Golf Course. 1km away from restaurants, bars, kiosks, bakery, supermarket, rent-a-car and travel agencies. 1.5km away from diving schools, gym, and the sea coast. The village of Canico is 2.5 km. The eastern coastline of Madeira contains the resorts hub of Madeira - particularly the area of ​​Canico. The east coast of Madeira is more popular with German tourists - the Germans began to develop the area for some years and the result is plenty of good resort facilities around the Reed and maritime nature park Tern. It is possible to dive in the area reserved with crystal clear waters of the Tern marine national park. 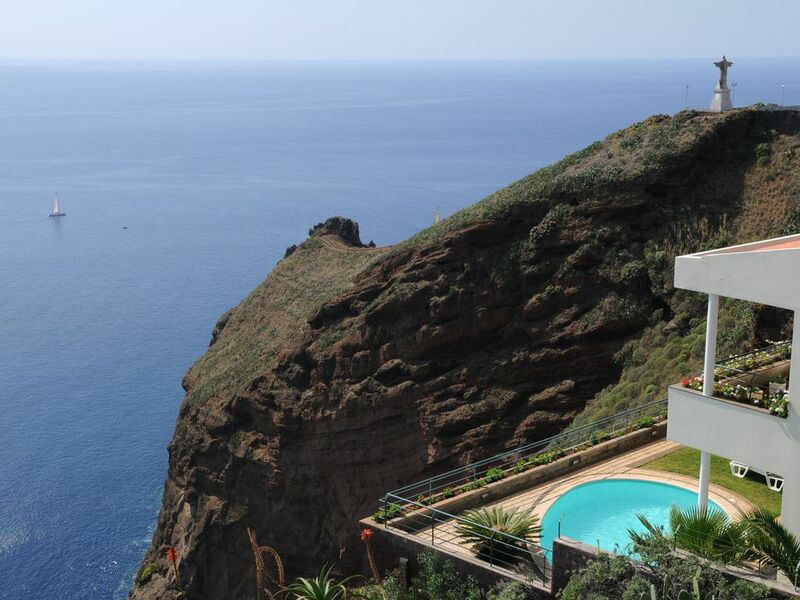 Canico is ideally situated on the east coast of Madeira, near the Madeira and Funchal Airport. This resort has been developed in recent years, with villas, bungalows, apartment hotels and many entertainment options. The development is focused on the coast with the pretty village in the interior of Reed, with a historic church, gardens, bars and fine restaurants. The golf course Palheiro is 8 km away. Several diving schools (qualified PADI) are located in the area. and several companies lease equipment, give lessons and organize excursions. Being er one of the main bases of the resort on the island of Madeira; the Reed also offers great places for hiking / taken and tours. Situated on the Atlantic Ocean in the parallel 33, the archipelago of Madeira has the same latitude as Casablanca and Bermuda. In Tern there is a miniature statue of Rio de Janeiro's Christ the Redeemer and / or Almada of Christ the King. It was erected in the wild rocky promontory at the southern end of the village in 1922.
can also be seen from the way zigzag in Tern village is a pebble beach and a cable car. Due to the Gulf Current water temperature is around 18Cº in winter and 24 C ° in summer, perfect all kinds of water sports. Different species of whales and dolphins (common dolphin, painted) can be seen throughout the year in boating. The marine reserve of Tern, East of Funchal was established in 1986. Considered today the first marine reserve in Portugal. In the existing fauna, garopas are, devil fish and blankets, whose graceful movements transform the place in international attraction. The peaceful human presence, allows freedom of swimming between them and the opportunity to take rare photos. Due to the location of this town will enjoy the uniqueness of a landscape, Zen and considered only area in the world. As tarifas mencionadas são em Euros, Por dia, por Casa "Self-Catering" na base de 4 Pessoas, incluindo IVA Pagamento € 30.00 por dia, por cada pessoa extra.